Lane County Fairgrounds (PDF map) , Eugene. Thursday: 9 a.m. — 9 p.m. Friday: 9 a.m. — 5 p.m.
Friday: 6 p.m. — 9:30 p.m. Saturday: 9 a.m. — 5 p.m.
$1 Admission on Friday, Tickets at the door starting 12 noon. Sunday: 9 a.m. — 4 p.m.
No consignments will be taken on Saturday. Consignment fee (per item) is 50 ¢. Sales fee (to sponsor) is 20%. Down hill boots must meet DIN standards. Alpine bindings must be indemnifiable. Clothing and equipment must be clean and in good repair. or phone after 5 p.m. 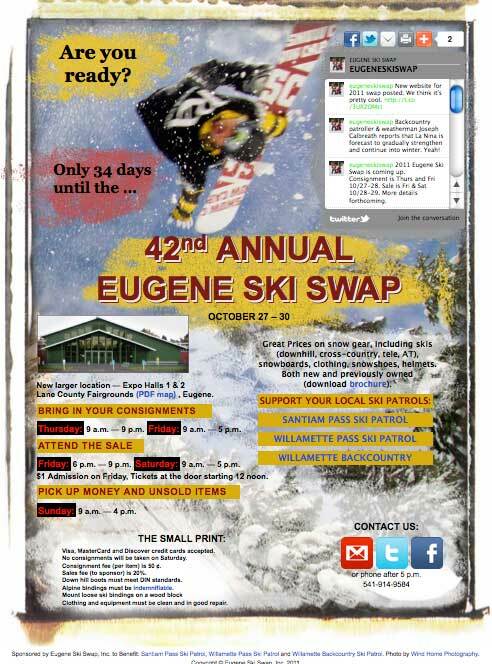 Sponsored by Eugene Ski Swap, Inc. to Benefit: Santiam Pass Ski Patrol, Willamette Pass Ski Patrol and Willamette Backcountry Ski Patrol. Photo by Wind Home Photography. Copyright © Eugene Ski Swap, Inc.